Associate Professor of History Deborah T. Levenson writes about how war and politics helped shape the gangs of Guatemala in her new book, Adiós Niño: The Gangs of Guatemala City and the Politics of Death. 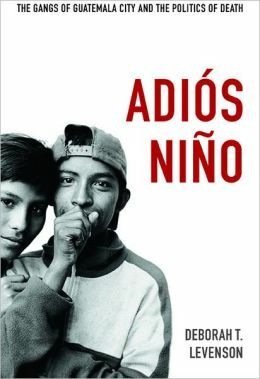 A historical study, Adiós Niño examines transformations in the Guatemalan gangs, called Maras, from their emergence in the 1980s to the early 2000s. According to the publisher: Levenson describes how fragile spaces of friendship and exploration turned into rigid and violent ones in which youth, and especially young men, came to employ death as a natural way of living for the short period that they expected to survive. Part of Guatemala City’s reconfigured social, political, and cultural milieu, with their members often trapped in Guatemala’s growing prison system, the gangs are used to justify remilitarization in Guatemala’s contemporary postwar, post-peace era. Portraying the Maras as microcosms of broader tragedies, and pointing out the difficulties faced by those youth who seek to escape the gangs, Levenson poses important questions about the relationship between trauma, memory, and historical agency. This entry was posted in Boston College Authors and tagged Guatemala, History Department, Latin America, violence. Bookmark the permalink.